This week’s Travel Theme from wheresmybackpack is Toys. Possibly not the kind of toy some may think of, but it is mine. 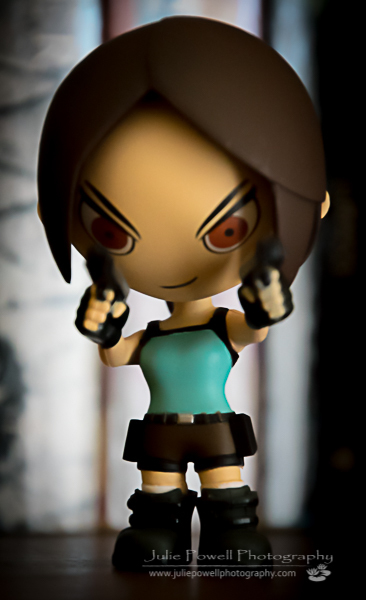 This is Lara Croft, AKA Tomb Raider, one of my favorite computer games. She sits just above my PC on my shelves. Granted it has been a while since I played, but my children got me the latest installment on PC for Xmas……now where did I put that disc? If you don’t see me for awhile, you’ll know where I am LOL! wonderful!! I tried one of those games and it near drove me crazy! lol _ but I do love to solve puzzles! Cyan’s Myst was right up my alley. I loved the puzzles too, more than just the shoot ’em up stuff. Hahaha! Let me know if you liked it!